Many of the most serious canine diseases – including Canine Hepatitis, Canine Distemper, Canine Parainfluenza and Canine Parvovirus – are preventable with simple dog vaccinations, Some of these conditions can cause very serious health problems, discomfort or pain for your dog. Some can be so serious that they can cause death within a number of days, potentially even hours. This article gives you all the information you need to know to ensure your best friend gets the protection they need. Why should you vaccinate your dog or puppy? Dog vaccinations will help your dog to be protected against some of the most common and most dangerous infectious diseases. For young dogs especially, it is critical to get the right vaccinations according to the puppy vaccination schedule to help build up their immunity. Dog vaccinations will not only protect your dog, they will also ensure your dog can’t infect others in their local dog community. Early dog vaccinations (see below for the adult dog vaccination schedule as well as the puppy vaccination schedule) will also allow you to socialise your dog earlier with other dogs. 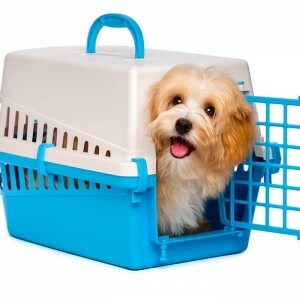 An up to date dog vaccination history is often required in places where dogs will closely interact with each other, such as boarding kennels, dog training classes and doggy day care. Immunisation is a relatively easy task to get organised. All vets have the ability and the equipment to quickly and easily immunise your pet against the biggest threats to their health. Even if your dog doesn’t mix with other dogs or you live far away from other people and pets, immunisation should be an essential part of any dog’s health regime. Vaccinating your puppy or adult dog means the same as it does for humans. Vaccines are health products that trigger the animal’s immune system to fight a specific infectious agent, without making the animal sick. Generally, the germs in the vaccine are weak or dead. In fact some don’t even contain any of the germs, they are simply there to mimic the germs. Dog and puppy vaccinations are basically a training camp for your dog’s immune system. The white blood cells in his body will produce proteins (so called antibodies) that will, together with other white blood cells, fight the infectious agent (called antigens). 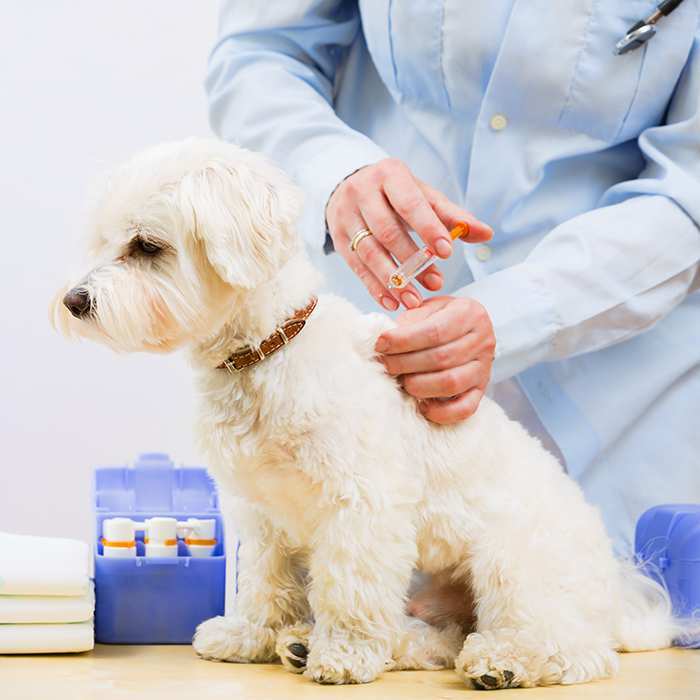 It is recommended to top up your dog’s vaccinations frequently to make sure his body still has enough of the trained antibodies to be able to fight the infectious germs when needed. 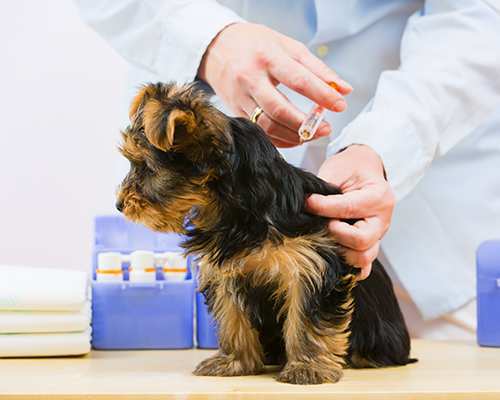 Which are the most common dog and puppy vaccinations? The Australian Veterinary Association (AVA) splits recommended dog vaccinations into “core” and “non-core” vaccines. These vaccines are recommended for all animals, to protect them against severe and life threatening diseases. These vaccines are for canine distemper virus, canine parvovirus and canine adenovirus (hepatitis) – a combination of these 3 vaccines is commonly known as C3 vaccination. 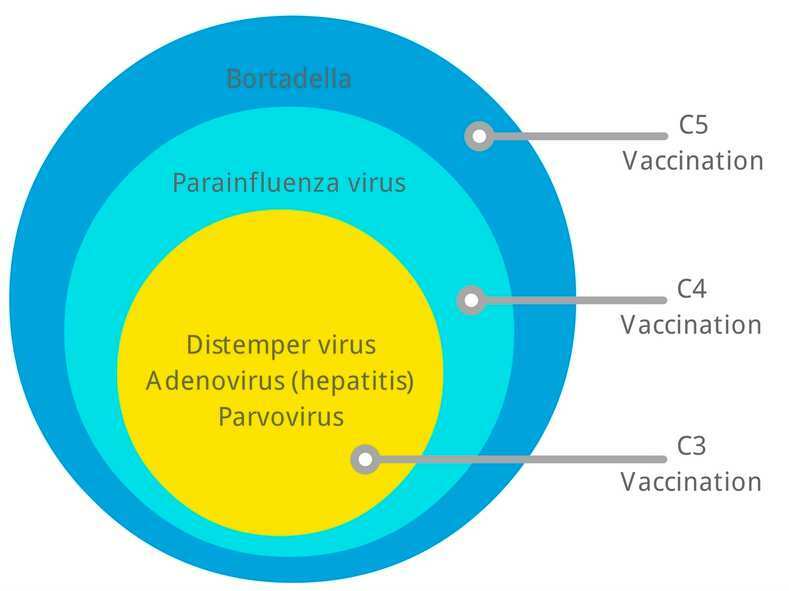 The non-core vaccines are for parainfluenza virus and bortadella bronchiseptica, which can both cause kennel cough. The vaccine for leptospira interrogans is also a non-core vaccine, which can be given in addition to the above but not at the same time. Dog vaccination costs can vary considerably, however the following prices are indicative: C3 vaccination around $60-70, C5 is around $85 – 90 and C7 can be $100 (prices as per October 2016). Prices can change and vary from location to location, so always check with your local clinic for prices. 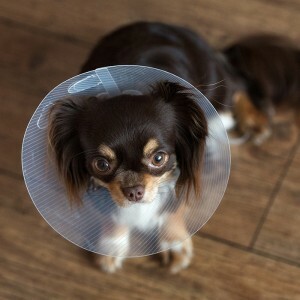 You can check with your pet insurer if they are able to cover some of the costs of your dog’s vaccinations. Bow Wow Meow can help you with the Routine Care cover to cover some of these costs. (Find out how much pet insurance will cost for your dog). 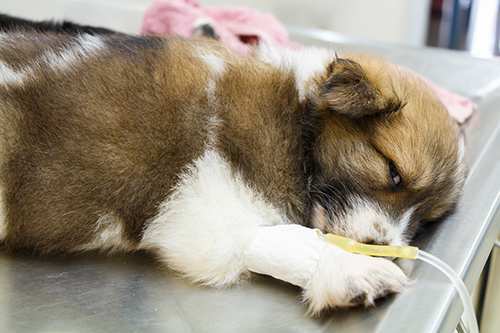 If your dog needs to be hospitalised and treated for Parvo virus, costs can easily exceed thousands of dollars. Parvovirus is also life threatening for your dog, so getting your puppy vaccinated will not just save money, it could also save your pup’s life. The following dog vaccination schedule is based on the recommendation of the Australian Veterinary Association (AVA). However, your local vet will advise on the recommended dog vaccination schedule for your pet. The recommended puppy and dog vaccinations will help protect your dog against a number of very serious diseases. Below we outline some of the more common diseases and how vaccinations help prevent them. The parvovirus is one of the hardiest viruses. It can survive in the environment for 12 months or more and can only be killed with hospital grade disinfectant. The virus is highly contagious and is usually passed on through contact with contaminated faeces or soil. Examples of such contaminated areas are parks, nature strips, show grounds and kennels. Direct contact with another dog is not required to spread the disease. The parvovirus has a very high mortality rate and most dogs will succumb to the infection within a matter of days. Vaccinating your dog will help prevent the infection and spread of the disease. If you are in doubt, it is best to carry your dog (using a handbag, stroller etc.). Chances of survival are dependent on how quickly your dog receives medical treatment. Usually, treatment involves several days of intensive care at a vet hospital. Caused by the canine adenovirus, infectious hepatitis is highly contagious. The primary mode of any infected dog spreading the virus is via direct contact with another dog through bodily fluids incl. nasal discharge and urine. 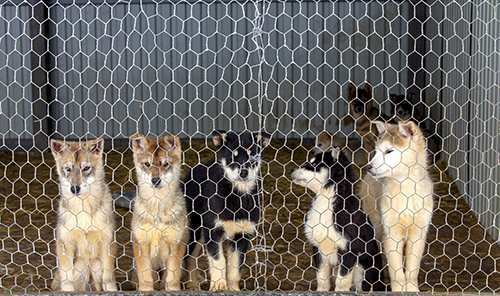 In addition to this, sharing cages, runs, bowls, toys and even human clothes and boots can be a source of transmission. Highly infectious, even dogs that have recovered from the condition may still pass on the virus for up to 6 months after it has been cured. The virus causes some serious symptoms and is most dangerous to young dogs and often fatal in puppies. This disease can be fatal within 36 hours. You may often see a “blue eye” as a symptom, which is a corneal opacity. Vaccinating your dog will help preventing the infection and spread of this disease. Treatment of symptoms is through administering of intravenous fluids and supportive care. There is no specific treatment for this virus. Thanks to highly effective vaccines, Canine distemper is no longer as common anymore as it used to be. Canine Distemper is a viral infection that affects the spinal cord, respiratory tract and the brain. 50% of diagnosed animals will die from the virus. Canine Distemper is airborne and transmitted by the infected dog or wild animal through sneezing or coughing. Transmission can also occur through sharing of dishes and equipment. Once a dog is infected, it can shed the virus for months. The virus can be passed on through the placenta of the mother dog to her puppies. Infected dogs become lethargic, tired and lose their appetite. In addition to this, vomiting, diarrhoea and coughing will often occur. The condition causes serious symptoms such as convulsions, progressive paralysis, brain damage and can lead to death. Vaccinating your dog will help prevent the infection and spread of this disease. Avoid contact with infected animals and wildlife. Treatment of symptoms is through supportive care and prevention of secondary infections. There is no specific treatment for this virus. Kennel Cough or infectious tracheobronchitis is a common infection mainly caused by two bacteria: namly, bordetella bronchiseptica and the parainfluenza virus, which target the animal’s respiratory system. Kennel Cough is highly contagious and effects dog usually where they socialise, such as dog shows, dog training classes, parks and kennels. Kennel Cough got its name because most kennelled dogs are susceptible to the disease because they have been exposed enclosed areas together with other dogs like boarding kennels and pounds. Kennel cough can be very easily spread, through airborne droplets produced by sneezing and coughing. It is not only spread by direct contact between the animals but also contact with contaminated surfaces including your hands and clothes. The common sign of Kennel Cough is a harsh hacking cough that often finishes with gagging. Exercise, pressure on the throat (like pulling on the leash when wearing a collar) and excitement tend to make it worse. Severe cases can lead to fever, lethargy and a reduced appetite. Most dogs recover within 3 weeks, however depending on their health. If your dog is older, recovery can take up to 6 weeks. Kennel Cough can lead to pneumonia, which is a serious condition and be sure to consult your vet immediately if your dog doesn’t improve within the expected time frame. If your dog shows any symptoms of rapid breathing, not eating, or listlessness, these could be signs of a more serious condition so it is very important to contact your vet right away. Sticking to the recommended dog vaccination schedule will help prevent the infection and spread of this disease. Keep in mind, infectious tracheobronchitis can be caused by many bacteria and viruses and therefore vaccinating your dog will help prevent infection with the two major organisms. There is still a chance your dog may catch some other virus causing Kennel Cough. Kennel Cough is not covered under Bow Wow Meow Pet Insurance. Refer to the applicable Product Disclosure Statement for details of Bow Wow Meow Pet Insurance cover. Most cases of Kennel Cough will resolve without treatment, however antibiotics and cough medicines can help to reduce the symptoms. It is advisable to use a harness instead of a collar until your dog is better. You should also make sure your rooms are well humidified. Tough it can occur anywhere, the Leptospira bacteria can be found in soil and water and is very common in areas with a warm climate, high annual rainfall and swampy conditions. Dogs can catch Canine Leptospirosis if they drink water contaminated with urine from infected animals (incl. mice, rats and even native marsupials). According to the AVMA, common risk factors include drinking from rivers, lakes or streams; roaming on rural properties (because of exposure to potentially infected wildlife, farm animals, or water sources); exposure to wild animal or farm animal species, even if in the backyard; and contact with rodents or other dogs. All it take to catch the Leptospira bacteria, is for the dogs mucous membranes (or skin with any wound, such as a cut or scrape) to come into contact with infected urine, urine-contaminated soil, water, food or bedding. 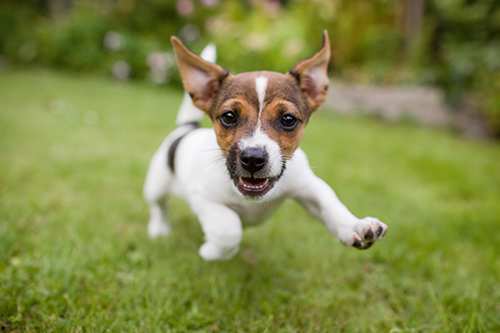 The dog can also catch the bacteria through a bite from an infected animal or by eating infected tissues or carcasses. Whilst rare, it can be passed through the placenta from the mother dog to her puppies. Canine Leptospirosis can be passed on to humans. Avoid contact with your dogs urine. Yellow gums are also common. The disease can cause kidney failure with or without liver failure. The signs usually start very suddenly as the disease is dramatic, causing death within a few days. Vaccinate your dog if you live in a high-risk area. For example there have been cases reported in the area around Darwin. Your local vet is the best person to advise whether you should vaccinate your dog. Avoid any areas where your dog could come in contact with contaminated water, animals or any surfaces. Antibiotics and supportive care are used to treat Canine Leptospirosis. If treated early and aggressively, the chances of recovery are good however permanent damage to the liver or kidney can still occur. The Canine Coronavirus is highly contagious and is one of the leading viral causes for diarrhoea in puppies. The virus primarily attacks the intestinal tract and spreads via shedding in faeces of infected dogs. Once infected, the incubation time can be somewhere between 1 to 4 days. The primary symptom is diarrhoea. Adult dogs are often naturally immune, or develop just a very mild, often not noticeable, case of the Canine Coronavirus Infection. Puppies less than 12 weeks old however are at greatest risk and weak ones especially can die from this disease. Most puppies will recover from medium to severe diarrhoea after several days. Unlike parvovirus, vomiting is not common. The diarrhoea is similar to when your dog is infected with the parvovirus but tends to be a bit milder. The only way to make sure it is not parvovirus is with a laboratory test. Vaccines can protect your dog in areas where the Canine Coronavirus is prevalent. Areas such as breeding and grooming facilities, kennel housing and hospitals should be disinfected with commercial grade products. There is no specific treatment for Canine Coronavirus, however supportive care is very important. Make sure the dog stays well hydrated even if water must be force fed or fluids given intravenously. Heartworms are parasitic worms that are spread by mosquitos, and this disease can be devastating. When the worms enter the dog’s body, they find their way to the heart and lungs and grow and multiply until the organs become clogged and eventually fail. Heartworm prevention medication can be administered as an injection between the ages of 12 and 16 weeks with an annual booster. Alternatively, the medication can be given as a tablet, which is very common, with most of them being given monthly or bi-monthly. Worried about ‘over-vaccinating’? Titre testing may be an option for you. Over the last decade there has been increasing debate about the over-vaccination of pets. Depending on the vaccine used and the individual animal, immunity can last significantly longer than 12 months. Some pet owners worry about vaccinating their pet whilst its immunisation is still sufficient. If you are concerned about this, and would like to test if your dog’s immunisation is still sufficient, an antibody titre test may be an option to consider. In this process, a small amount of blood is taken from your pet and a laboratory test is used to determine the level of antibodies in your dog’s body. Your vet will then be able to recommend if your dog will need to be re-vaccinated or not. While immunisation may be costly, it is an essential part of ensuring your dog lives a happy and healthy life. Seeking out pet insurance is a great way to help cover these costs. Bow Wow Meow can help you with Routine Care cover to contribute towards some of these costs. Check how affordable pet insurance can be. Remember, whilst it is a great preventative measure, no immunisation is 100% effective. In the unlikely event that your pet still develops a serious condition after immunisation, with the right insurance, you’ll know they’re covered.